Back in July there was a call out for designers to work with a product that I had never ran across so of course I put my name in the hat. 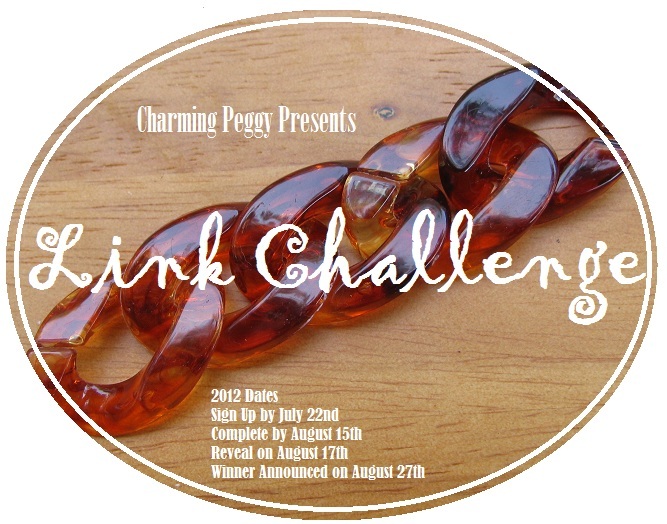 And I was very happy to find out that Charming Peggy had selected me to be one of the designers working with acrylic links. Now these links are much larger then anything I have worked with before and my first thought was to design a bracelet. 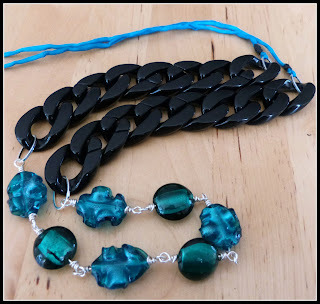 Digging thru my stash I found some murino style glass and a necklace was born using the acrylic links along with the glass on wire-wrapped links and a silk strand. Now that you have seen my humble offering be sure to check out everyone's masterpieces. And last but not least be sure to hit our hostess's blog to vote on the design that you liked the most. I love the blue and green glass. So beautiful! I especially love the color combination that you chose! Great colour combo! And those don't_know_how_to_describe_them beads are great! A great piece. The colors are oustanding with those black links. And I really like the silk strand as the clasp/tie on. Nice. 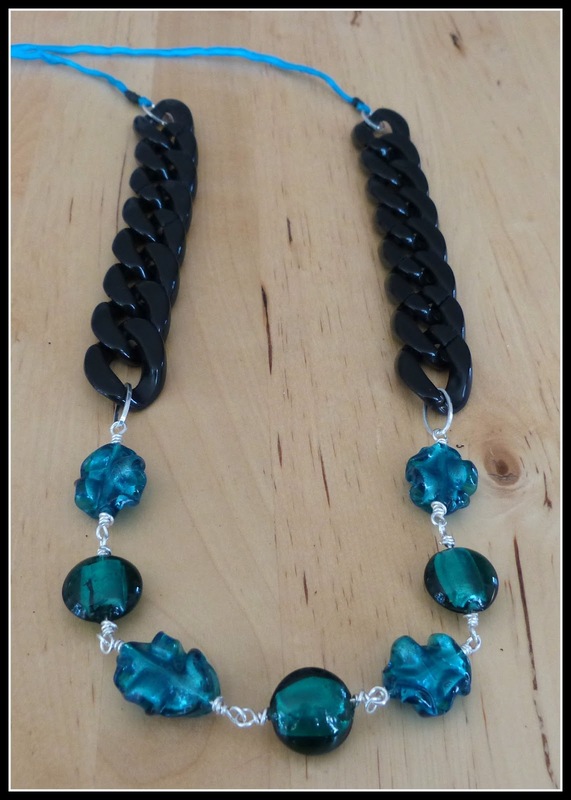 The lamp beads and the lumpy glass beads add not only color to the black links...but a cool texture to the piece..nicely done! So many people are say that these links were so much larger than they had expected. I think that is funny because in my shop I sell much larger links. I love that you used the ribbon and glass beads with the links, it really shows how versitile they can be. I too like your choice of glass color to go with the black links. Makes for a very classy looking piece. Well done. Sometimes I forget how good black looks with blue. Thanks for the reminder! Beautiful necklace. 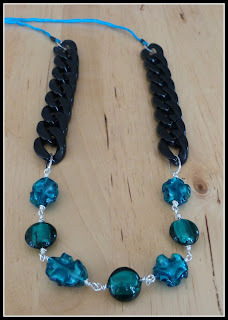 I love the blue beads with the black links, so pretty. Shai, those chunks of blue glass are the perfect compliment to the links. VERY, very pretty!! Those are really fun beads with the links and the scale is perfect. Great job! Very beautiful.. I love that color blue.